While Halo or its sequel probably wouldn’t make my list of top ten games (Bungie please see Valve about unique level design) I still find driving the Warthog ridiculously fun. So now that I see the WETA Workshop has constructed a fully-functioning life-size version of the Warthog complete with four-wheel steering and and a machine gun I’ve already started packing my bags with the intent of traveling to New Zealand to steal or in some way commandeer this vehicle. I’ll worry about sneaking it through customs later. 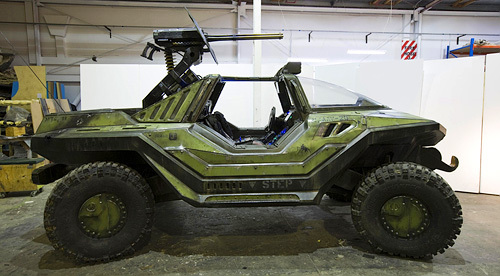 The Warthog was actually built for a series of upcoming Halo themed short films that WETA is involved with but you can pretty much guarantee it will also be hitting the publicity circuit once the Halo 3 marketing machine goes into full gear. For a 2000×1278 pixel version of that photo suitable for desktop wallpaper or hanging over the fireplace click here.